Once upon a time an enterprising rock climber launched a line of clothing for extreme sports. He named it “Patagonia,” a word that triggers a visceral reaction in adventurers and wannabes. Even the armchair traveler experiences a shiver visualizing one of the wildest regions on earth, a faraway place with strange creatures, rugged terrain and mercurial weather. Ferdinand Magellan, one of the first to explore the tip of South America, called the region Patagon, meaning “giant” or “big foot.” His expedition encountered tall natives which grew taller with the telling until it was considered fact that the region was inhabited by 12-foot-tall savages. The “giant” myth was not debunked until 250 years later, in the 1800s. 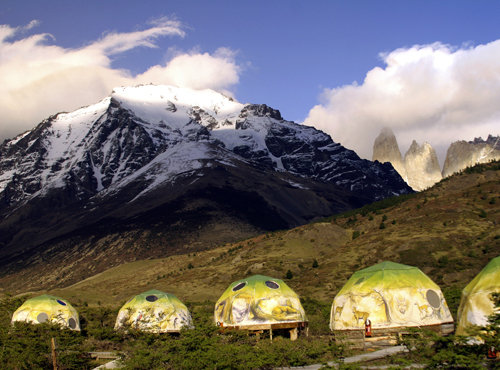 But Patagonia has remained a Shangri-La–remote, beautiful, shrouded in mist and mystery. The wilderness of mountains, steppes, glaciers and lakes sprawls over an area the size of Texas at the end of the Andes in southern Chile and Argentina. It has become more accessible, but no less mystical. Patagonia owes nothing to man; it merely tolerates his presence. In the 1950s, Chile took steps to protect exceptional areas of Patagonia, giving rise to the Torres del Paine National Park–600,000 acres now recognized as a UNESCO World Biosphere Reserve. It’s a four-hour flight from Santiago, Chile, south to Punta Arenas, and almost three hours by road to Puerto Natales, the nearest town to Torres del Paine. Visitors from all over the world arrive in this simple fishing village. From October though April (spring and summer in the Southern Hemisphere), there’s a babble of mixed languages in the narrow streets, small restaurants and modest inns. Excitement is in the air, and a pulse-quickening anticipation. Strangers grin at each other, as if recognizing members of a secret fraternity. After a night in the Hotel Charles Darwin, our group of ten piles into a van for the 72-mile drive into the park—most of it on dusty gravel roads that discourage speeding. In the flower-speckled fields, gauchos and their dogs trail a flock of sheep. We stop to explore the Milodon Cave, where a giant prehistoric sloth was discovered in the late 1800s, causing a stir akin to finding the Abominable Snowman. In the grotto is a life-sized statue of the 12-foot-tall critter, standing on its back legs. It’s late afternoon when we arrive at EcoCamp, a cluster of geodesic dome tents. The structures are eye-catching, but only momentarily. The gaze is drawn inexorably up, up to Nature’s canvas—craggy, snow-covered peaks jutting from grassy steppes and The Towers, granite spires caressed by clouds, golden in the fading light. The EcoCamp sits on wooden platforms connected by boardwalks. There’s a bath-house (with showers and composting toilets) and a large dining and lounging dome warmed by a pot-bellied stove. In a shed near the dining tent a lamb rotates on a spit, its juices sizzling in the fire. We gather around, sipping pisco sours and savoring the scents. When we sit down to dinner, the taste of the tender meat is even better than its aroma–and the Chilean wine goes down easily. We turn in early, knowing there will be hiking tomorrow—and we’re all anxious to see what it’s like in our two-person tents. Wonderfully cozy, as it turns out, with flannel sheets, down comforters and sheepskins on each bunk. The night is cold, but our beds soon become warm cocoons. A window at the back of the tent faces The Towers, lit by the moon. Overhead, another window frames a canopy of stars. and hares. And, unfortunately, on sheep at the ranches bordering the park. 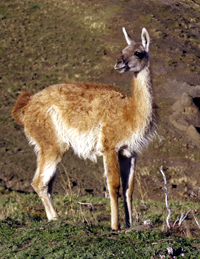 As we set out for Lake Pehoe in the van, the pumas are not to be seen, but guanacos are everywhere, gazing at us with liquid brown eyes. Rheas race alongside our vehicle and foxes pause in their hunting, wary but unafraid. In a shallow lake, the wind ripples the reflections of feeding flamingoes. A rough path leads to the Salto Grande Waterfall, a spectacular torrent flowing into Lake Pehoe. On the bank of the lake is the famous Explora Lodge, the only luxury resort in the park. Sleek and ultra-modern, it seems somehow intrusive in this raw, beautiful wilderness. Moving on to Lake Grey (its waters are milky from glacial silt), we follow a rocky trail through the forest, over a swinging bridge and along the shore of Lake Grey to a dock where zodiacs toss in a violent wind. Climbing aboard, we hang on for dear life until we reach the big catamaran. Waves dash against the windows as the captain sets course for Grey Glacier, weaving among huge icebergs. As blue as Paul Newman’s eyes, the house-sized bergs drift across the lake to the beach, where they linger for weeks, slowly melting. The 20 passengers aboard balance pisco sours as the ship pitches and rolls, savoring the adventure and trying not to think of the water temperature. Titanic is understandable in any language. 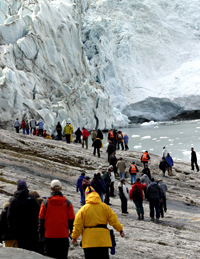 Suddenly the glacier emerges from the mist, towering nearly 100 feet above the boat as it cruises along the face. We brave the cold to listen for the crack, sharp as a rifle-shot, that signals the calving of massive hunks of ice. At last the ship turns and runs with the wind back to shore. We spend our remaining days hiking, the best way to experience the park. An 11-mile trek leads to the base of The Towers; a two-hour stroll along Lake Sarmiento turns out to be a wildlife bonanza. With its 155 miles of paths and countless rock faces, the park is heaven for climbers and trekkers. Some opt for day trips from established camps and lodges, while the hardiest hike the famous seven-day “circuit” laden with tents and supplies for wilderness camping. Patagonia is so far south it seems like the end of the world—but there’s more. Back in Punta Arenas, we board the 100-passenger Mare Australis and head south, through the Strait of Magellan and the Beagle Channel, waters once plied by Antarctic explorers such as Byrd, Scott and Shackleton. Conditions aboard the Mare Australis are more luxurious than their Spartan ships, with roomy cabins, private baths and large picture windows. The “daily rations” are sumptuous—including fresh Chilean king crab, conger (eel) and sea bass, and filet mignon from the Argentine pampas. And we never run short of Chilean wines. The Mare Australis sails through a frosty wonderland in which snowy mountains plunge into the sea and glaciers glitter like diamonds. Every day, zodiacs take passengers ashore to hike through primordial forests, observe elephant seals and Magellanic Penguins, and drink scotch on ice straight from centuries-old glaciers. On day three we pass through Glacier Alley, a spectacular channel with glaciers named for four countries. As the ship passes, national anthems peal from speakers and the crew serves appropriate drinks and hors d’ oeuvres—German beer and sausages, French champagne and cheese, Italian wine and pizza, and Dutch potato cakes and beer. The following day we brave the icy sea off Cape Horn, the southernmost point in South America. High winds, strong currents and icebergs have sent more than 800 vessels—and countless sailors—to watery graves here. The Panama Canal makes it unnecessary for most vessels to round the Cape, but it’s still a rite of passage for many yachters. The weather is at its mercurial best and worst at Cape Horn National Park. Crewmen in wetsuits stand waist-deep in roiling icy water to help passengers from the zodiacs. A howling wind buffets the steep steps leading to the crest of the inhospitable rock. There stands a monument, a stylized albatross, honoring the legendary savior of sailors. The tiny chapel is a memorial to the lives lost. In the modest visitors center, we buy cards with the Cape Horn postmark–proof of our surreal journey. 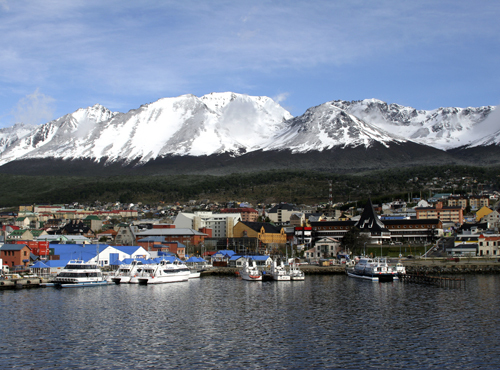 Sailing into Ushuaia, Argentina, we’re greeted by a sign, “Fin del Mundo—the End of the World.” Cape Horn and the military base at Port William are farther south, but Ushuaia is the southernmost town in the world. Our flight back to Santiago, the beginning of the long journey home, leaves late in the afternoon, so we have time to explore. One oddity is the Maritime Museum, now occupying part of the prison that housed the worst of Argentina’s criminals until 1940. Adjacent to displays of early Antarctic explorations are blocks of cold, damp cells, some with signage about the notorious inmates. Ushuaia was a town where adventurers arrived full of anticipation, and prisoners arrived full of dread. For both, it was often the end of the world. Adventures in Torres del Paine while staying at the Patagonia EcoCamp (www.ecocamp.travel) can be booked through Cascada Expediciones (www.cascada.travel/en), which arranges five-day trips. Cruceros Australis (www.australis.com) operates two ships with four-night cruises between Punta Arenas and Ushuaia.